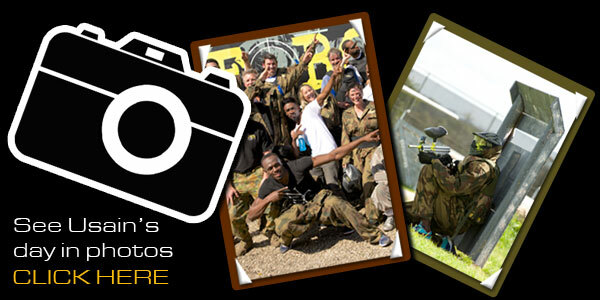 Usain Bolt Plays at Delta Force Paintball – Again! The world’s fastest and arguably most charismatic man Usain Bolt became a repeat guest at Delta Force Paintball on Friday 26th September 2014 when he embarked on another day of paintball adventure at the Delta Force Dingley centre in Melbourne. Joined by Aussie sprint legend John Steffensen and four of his Jamaican compatriots, Bolt took to the paintball fields in Dingley to showcase his array of sporting skills away from the track. Donned in full head protection goggles, full length combat suit, armoured gloves, body armour and special ops tactical vest, Bolt looked every part the paintball warrior out in the battlefield as he urged his team to victory on the war-torn airfield game zone. Bolt, Steffensen and their fellow teammates were pinned against a corporate team who were down at the centre for a team building event. They were shocked and excited to see who their opponents would be on the day. At Delta Force Paintball you never know who you’ll meet during your special day out! Throughout the event Bolt yet again praised Delta Force Paintball on the standard of safety equipment and game zones, commenting that “I’ve never seen a centre like this – we don’t get paintball like this in Jamaica.” As a special memento of the occasion Bolt was issued with a special ops tactical vest for his next visit to Delta Force Paintball. Bolt and his entourage had flown into Australia to cheer on the Hawthorn Hawks to victory in the AFL premiership, and during his stay he specifically requested another game with Delta Force Paintball. Bolt’s keenness for a repeat battle at Delta Force Paintball is a clear indication that he loved the service, experience, facilities and safety delivered during his first visit. Usain, we know that you have the choice to play paintball at several different locations across Melbourne, and we are honoured and grateful for the fact that you have yet again chosen Delta Force Paintball to host your special event. We look forward to seeing you again. 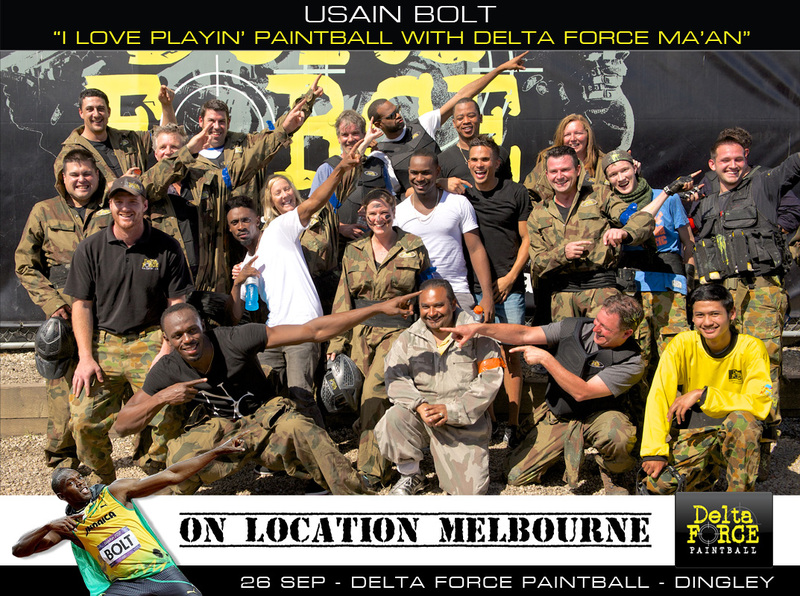 Lucky Delta Force paintball patrons get to play paintball with the great man, Usain Bolt and Aussie John Steffensen.